Howdy everyone! I hope you all had a nice start to the work week. Mondays can be so blah after the weekend. Especially after a busy one. Sometimes you need a day off from the weekend!! That was sort of where I was at when my alarm went off this morning. Anyway, I thought I would post a picture of some cormorants today. These guys were enjoying a sunny rock a little downstream from the base of Niagara Falls. They seemed to be just hanging out, and had no special concerns for the time being. 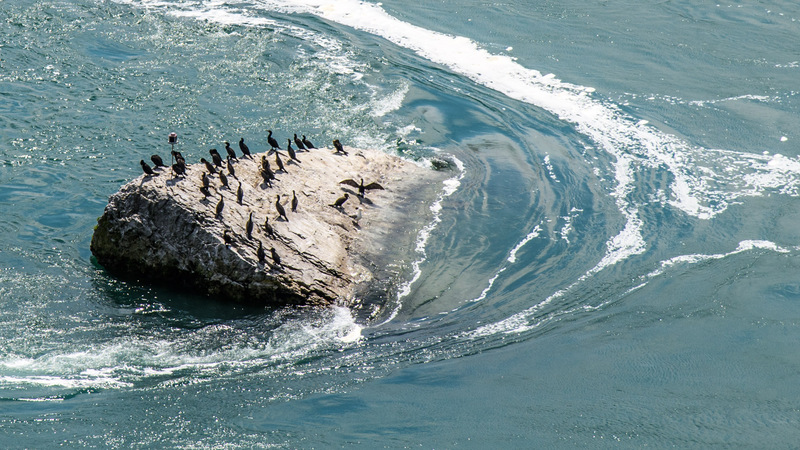 Cormorants are the best fishers on the planet, and they really seemed to like this rock. If I were fishing in this area, I’d probably take a lesson from these birds and throw my line in right by this rock. You can see the power of the current as it flows past the rock. At different times, one or more of them would spread their wings to dry out a bit. I must have taken half a dozen pictures trying to get one doing this in a way that looked dramatic. This is the best result of that effort. This was one of those times that I wished I had my 300mm lens available to me, but it was in the hotel room. I know…that was a great place for it now wasn’t it? I hate when I get lazy with my gear and try to travel light instead. The result is usually a frustrating situation like this. Sometimes I’ll wish it was like Star Trek, and I could just “beam” back to my gear, and get the stuff I needed. Of course, this type of thinking does me no good. It’s at times like this that I’m glad I have 36 megapixels to work with. I probably cropped 30 of them away to get this composition. That means that aside from a 5 by 7, this image is at it’s fullest size. Next time, and yes, there will be a next time, I will take all my gear. These are majestic birds, and they deserve the full potential of what my 300mm lens can do. You live and you learn. A good lesson not only for photography, but for just about anything else too. It’s better to have it, and not need it, than need it, and not have it. Take care and have a great week. Well, it’s time for a little experimentation. I have been fooling around with photoshop a little bit trying to create a “dreamscape” type of shot. You might notice that some areas of this picture are kind of blurry, and some are in relatively crisp focus. It’s an effect I’ve seen out there and I really like it. Some would call it a painterly effect, but I don’t really think that’s what I’m going for. I’m sure that if you asked 10 photographers how they achieve their unique effect, you’d get 11 different answers. Mine involves Gaussian blur in one layer and a high pass filter effect for ultra crispness in another layer. Then I used a layer mask to paint blurriness in. I used a reduced flow brush to put more blur in some areas than others and believe me, lots and lots of use of the history tool to erase all kinds of mistakes. Overall, I’m pretty ok with the end result, but I reserve the right to work a little more on the technique. I’ve heard of photographers taking two different pictures to create this same effect. 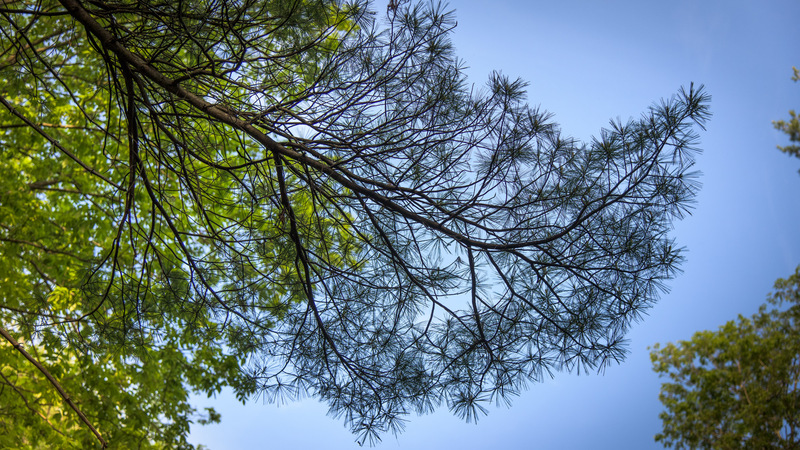 Each picture set at a different aperture for a different depth of field, or two completely differently focused images. This might be a great idea, however, I had no idea I was going to try that with this image when I took it; so I only had the one image to work with. I’ve also heard of people using textures to achieve this effect. Like I said, 10 photographers, 11 answers. If you’ve ever tried this sort of thing let me know. That is if you don’t mind sharing your secret sauce. A quick note about this picture. It is, of course, of a waterfall. As I’ve said before, waterfalls are one of my favorite subjects. 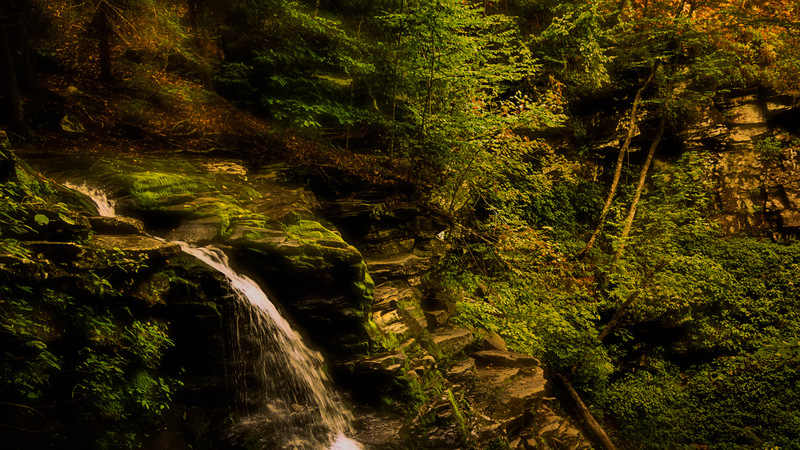 I took this image at Rickets Glen State Park, which is a short drive from my home. I’ve posted waterfall shots from this place before, and I have plenty more to share. There are a few dozen of them in the park. It was late afternoon, and a really hot day. Some friends of ours from the UK were with us, and we happily obliged them in a quick nature hike along a cool stream. Later that evening, we roasted marshmallows and made them speak with American accents!! It was awesome and hysterical!!! Almost as funny as our British accents, that is!! Hi everyone! I’m back with another travel posting today. This is from the Canadian side of Niagara Falls, where my family and I spent a few days last summer. We had a great time walking around the falls, and taking in the Canadian side of things. It was also a sort of homecoming for my wife and I, as this was the sight of our first date back in 1988. It was neat to walk around again, and see what had changed, what hadn’t, and been able now to share it with the Kiddos, who thought the whole notion of their parents dating was just too gross. On this particular evening, we were up on a huge observation deck called the Skylon Tower. I’m not sure how tall it is, but it offered spectacular views in every direction. This particular view is facing south, back toward the US, and the city of Niagara Falls, NY. It was blue hour while we were up there, and light was fading fast. They were super cool about my camera at the tower, but the tripod did not make the trip up, so this was hand held. I braced the camera against the grid work of fencing that encloses the deck to keep it from shaking, but the image is a bit soft if you zoom in. Beyond the American falls are the lights of the downtown, and as with every blue hour, the lights had come on to accent the landscape itself. That’s why its’s one of my favorite times to shoot. 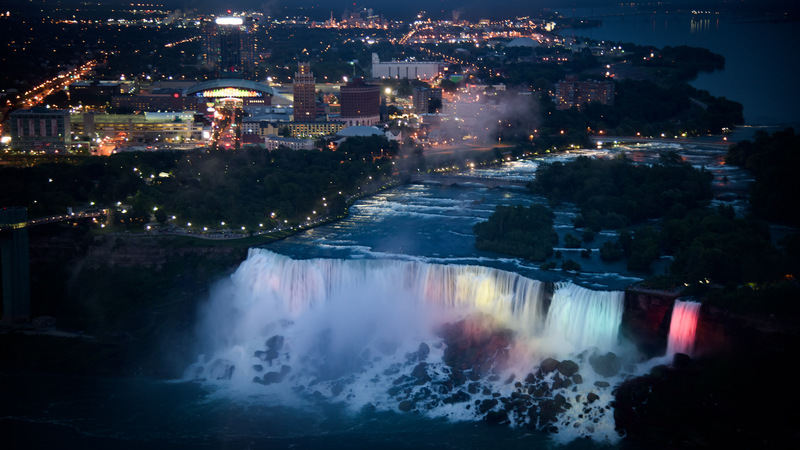 In the evenings, the falls are illuminated with some incredibly strong lights which change color. Personally, I would have preferred all white brilliance to the disco theme multicolor, but that’s just me. Oh by the way! Happy Winter everyone. Today is the first day of winter, and the longest night of the year. Too bad it’s going to be 65 degrees (18C) here on Christmas, and the snow forecasted for this past weekend was a no show. Things are still looking a bit green around here, but I figured I would go with the season and change my header image anyway. I’ll talk more about them (current and previous) in a future post. Until then, keep warm if you have to, and have a great week. There’s no place better on a hot summer day to take refuge from the heat than a waterfall. That’s exactly what happened a few months back on a crazy hot day this past summer. We decided to pack up, and hit the trail. This place is so cool. There is a huge lake on top of the mountain, and it cascades down a five mile slope resulting in close to 40 different waterfalls, some of which are 100 feet (30 meters) high. 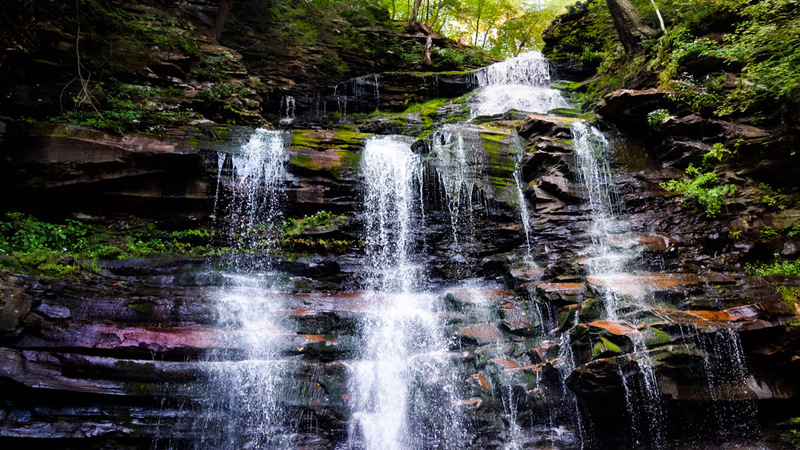 The trail has some challenging elevation changes but that’s what gives you these awesome waterfalls, and on this day, some much needed relief from the heat. If your ever near Red Rock, PA, check it out, it’s Rickets Glenn State Park. It’s a bit of a drive from my home, but well worth it. It’s funny because I always knew it was a nice place for photography, but when I started seeing pictures taken there by people from Europe, I was so surprised. I guess it goes to show you a truth we often ignore in photography, that some of the best shots to be had are practically in your own back yard. I once believed I could only get amazing shots by traveling somewhere exotic, but not any more. Rickets Glenn proved that to me. 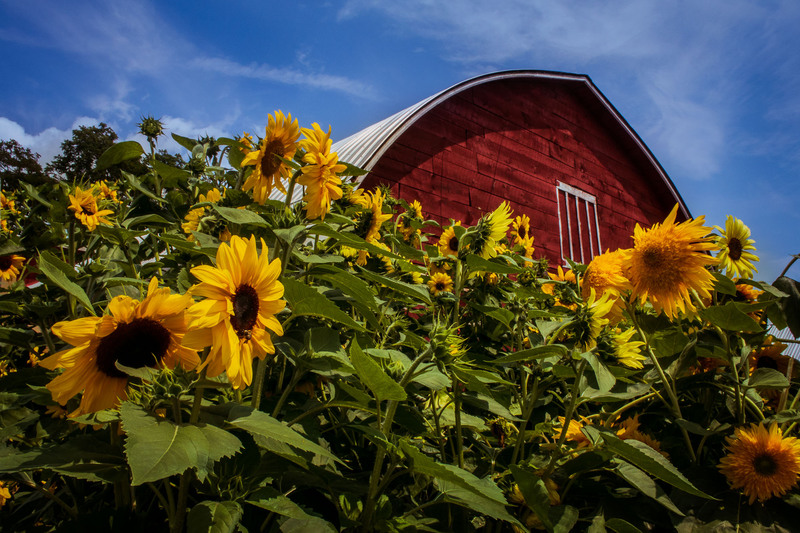 Challenge yourself to see what you’ve been missing in your own hometown. Look at it with a strangers eyes and you’ll be amazed at what you’ve missed. With that said, I’ve included a shot of one of the many waterfalls at Rickets. I love photographing waterfalls, but I have such a difficult time framing them, or finding the best point of view. Then there’s the whole, ” to long expose the water or try to freeze it” conflict. If I made a top 10 list of favorite things to photograph, waterfalls would definitely be in there, but if I made a list of most frustrating subjects I try to photograph, waterfalls would be right near the top. (I think this just gave me an idea for another post) Anyway, I hope you like this one, and remember we’re on the downslide to the weekend at this point. Have a great rest of the week.